After enjoying a Pune Diwali, we had our last few days of yoga classes at the Iyengar Institute, and our last couple of weeks at the ashram. 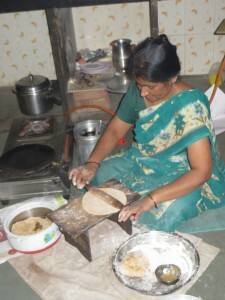 We will miss Sangita, who has been our Indian mama at the ashram, cooking us three meals a day, and laughing at all Ravi’s jokes, no matter how silly. 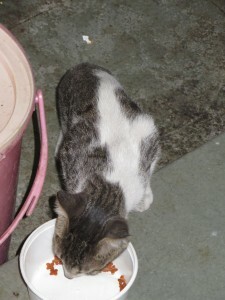 In this time, yet another cat showed up in the ashram kitchen – this time, a relatively young kitten. We dubbed him “Tora”, which means “Small”. He had a very interesting fur pattern, looking completely tabby from one side, and 50% white from the other side. Ravi explained to him what cat biscuits are, and he took to them like a duck to water. We haven’t seen Bili The Kitchen Cat for a while, perhaps because Oscar the tomcat was chasing her away. In any event, she will likely be disappointed next time she visits, because workmen came during our last week at the ashram and enclosed all the windows with metal mesh, so Rocky the Kitchen Squirrel is going to be losing weight over the next few months, and Bili’s daily entertaining windowsill show has been axed. After Diwali was also the time Jenny started running clinics for the TMLP in India. 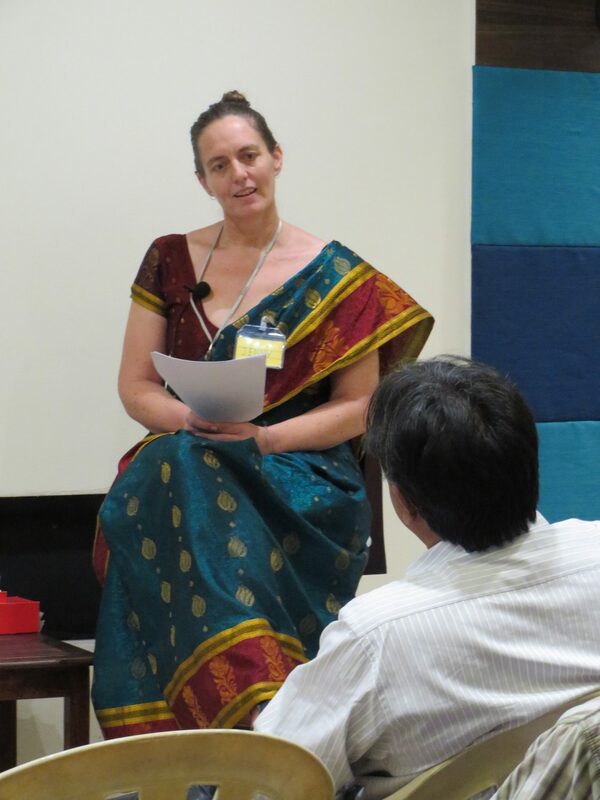 The Pune team were first cab off the rank, with an Existence Clinic, followed by a combined Games in the World and All The Distinctions clinic. The Mumbai team sent a car to Pune to collect us and take us to Mumbai (three hours plus of driving) for a clinic marathon – SIX HOURS of clinic, covering every documented clinic which existed at the time. The room was packed with 40 or 50 people, and despite the intensity of concentration required to participate actively in deep inquiry, everyone stayed engaged until the end. And then they said they wanted more! If they can organise it, they will fly us back to Mumbai as we pass through Delhi on our way to Rishikesh in January. We shall see. 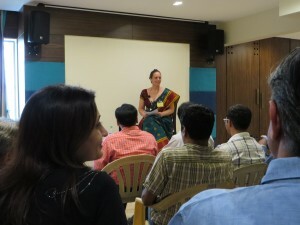 In the meanwhile, there is still the Goa team, who want a clinic while we are there. After the Mumbai clinic, Jenny spent half a day training four people who want to lead clinics in India, and half a day working with Bhairavi, who is about to begin a year of being the person accountable for training the TMLP in India. It turns out she lives in the next street to the ashram, and she was very upset to learn we had been there for three months before she met us! 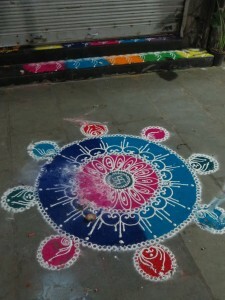 We only had a few days left in Pune by this point, so we hurried to fit in the last few things we had been meaning to do. 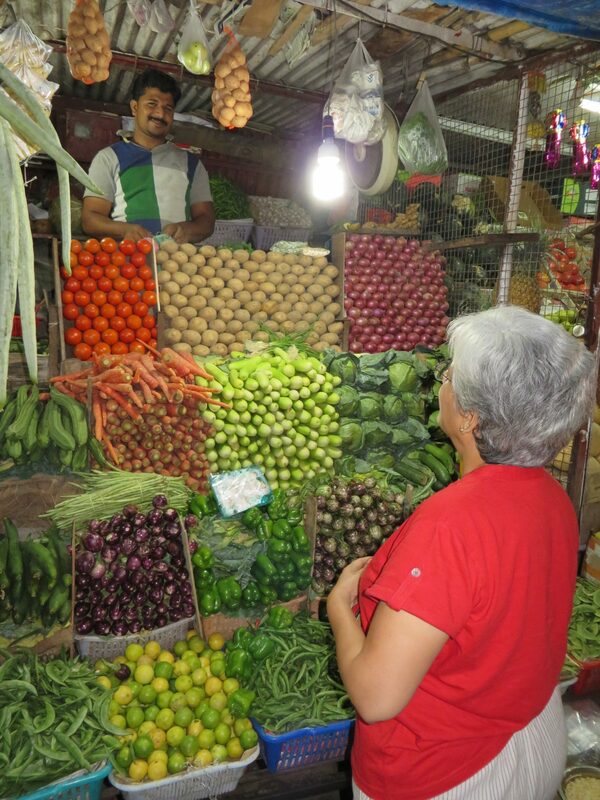 We finally got to the market in Model Colony, where the stallholders have a daily competition in vegetable Tetris. It always looks amazing – in contrast to almost every other market we have seen. The optometrist also had a very cool ultrasonic cleaning machine, and cleaned Ravi’s glasses for him, The adjustment and the cleaning were free. Some people are just lovely. We had our last few Thermoses of chai from our friendly neighbourhood chai walla – his store is directly across the road from the ashram gate. 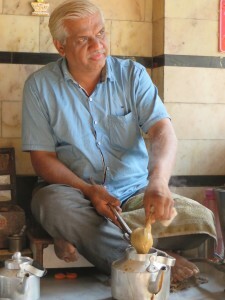 Those tongs he is using to squeeze the chai through the cloth are also what he uses to pick up the pot of boiling milk. Pots in India don’t generally come with handles, so everyone has some form of metal gripping tool to move their pots around on the stove. Broom handles are another thing that hasn’t caught on in India – everywhere we go, we see brooms that are basically a bunch of sticks tied together at one end, about a metre in length. Everyone we see using one is bending right over. Jenny went back to Mumbai to do a day of business consulting, which turned out to be a long day, since the car that picked her up then went back to Pune city to pick up someone else, and therefore ended up leaving the city later than planned, and therefore encountered more traffic than planned, and then the driver didn’t know his way around Mumbai, so the trip took four hours. Coming back on a bus also took four hours, so she ended up travelling eight hours as well as spending five hours in the client’s office. 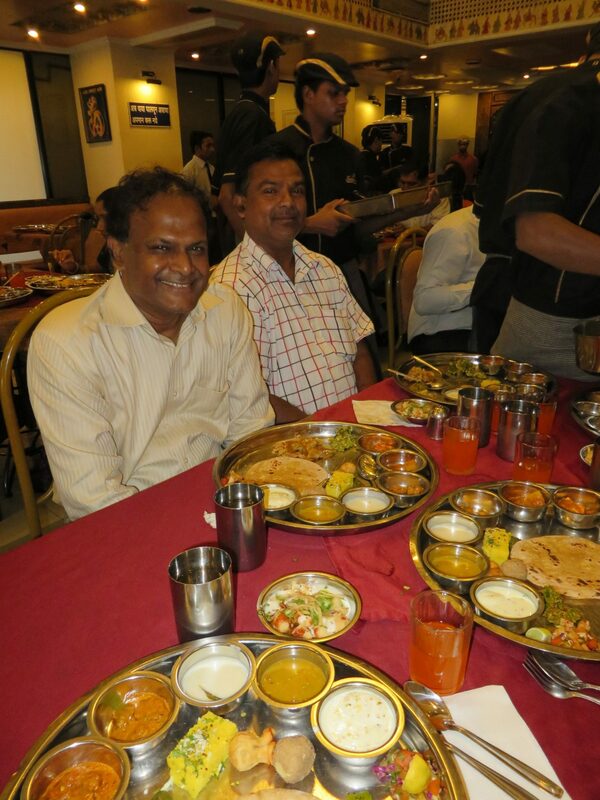 Raju from the Pune team took us out for a traditional Maharathi meal before we left (Pune is in the state of Maharatha), along with Subash, who we hope will stay in touch with Raju and Bhairavi, so that he had friends to help his wife and children settle in when they move to Pune next year. 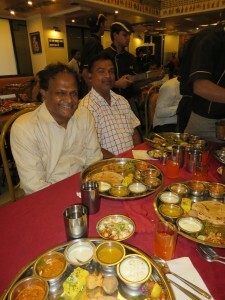 The food was amazing, and the staff kept coming around and topping up the bowls. It was all-you-can-eat-and-then-some! Raju and Bhairavi told us about a whole lot more things we could do around the Pune area, and extracted a promise that we would be back in Pune again soon. After such an incredible lunch, there was just a final packing, and we headed to the station to board our third-class sleeper train to Vasco Da Gama station in Goa, to begin the next chapter of our exploration.